One lucky couple will win an amazing wedding. 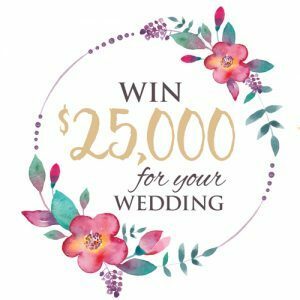 Select your own location and the wedding professionals of your choosing - we’ll pay for everything, up to $25,000. REGISTER & ATTEND ANY OF OUR BRIDAL SHOWS FOR A CHANCE TO WIN! HOW TO ENTER: During the Giveaway Period you must REGISTER & ATTEND ANY OF OUR BRIDAL SHOWS to enter the Giveaway. All entries must be received by the Giveaway End Date (Friday, May 31, 2019, at 11:59 PM ET). Proof of sending or submission will not be deemed to be proof of receipt by Sponsor. Any attempt by any participant to obtain more than one (1) entry per household by using multiple email addresses, identities, profiles, registrations and logins, or any other methods will void that participant’s entries and that participant may be disqualified. Use of any automated system to participate is prohibited and will result in disqualification. Normal Internet access and usage charges imposed by your on-line service may apply. Participants do not need to make a purchase of any kind to enter the Giveaway. Regardless of method of entry, to enter the Giveaway, each entrant must complete the entry form with all required information (which will include your full name, full address, city, state, telephone number and age), and agree to these Official Rules. Photocopies of print ballot entries and mechanical reproductions submitted at an event and entries by any means which subvert the entry process will be void. All entries become the property of Sponsor and will not be acknowledged or returned. "Love my honey 🍯 "